During the last two weeks, I've allowed the new iRobot Roomba i7+ to clean my apartment. What attracted me most about this vacuum cleaner robot is its ability to clean itself, an aspect not to be underestimated, especially if you are also lazy like me. Is it worth buying despite its prohibitive price? The iRobot Roomba i7+ is available for purchase on the manufacturer's official website at the price of (wait for it) $1,099.99. It's a very high price, that's true, but you have to consider that the vacuum cleaner robot itself costs $800, so like a normal iRobot. What makes the difference, in this case, is the charging station equipped with the automatic emptying system, which can also be purchased separately. As for the accessories and various spare parts, you are in good hands. Just go to the accessories section of the iRobot website. 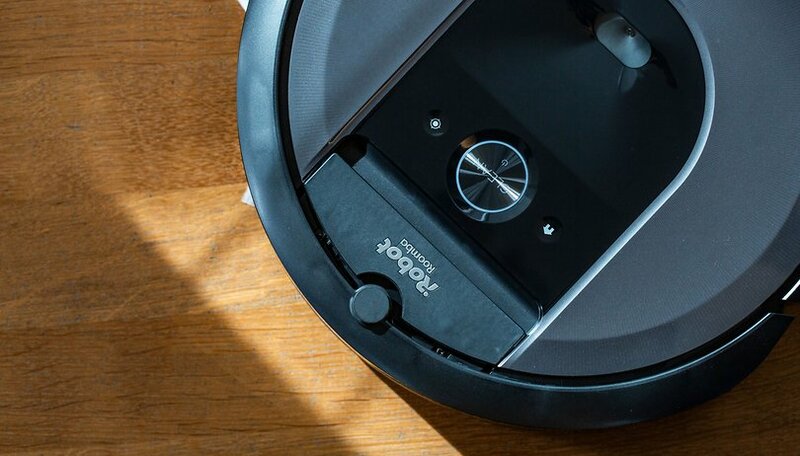 At first glance, Roomba i7+ looks like any of the manufacturer's other robots , but this model has been redesigned both inside and out. Under the hood, it has an updated processor and more RAM to help it manage the new features. Outside it is equipped with a new cleaning head and two rubber brushes suitable for all surfaces, all accompanied by a suction system twice as powerful as the previous Roomba. Inside the package, in addition to the brush and replacement filter, you can also find a "virtual wall", or a laser sensor that prevents the mapping of a part of the planimetry. It is, in fact, possible to place this accessory near a door so that the robot only cleans a certain perimeter of our house. I, for example, placed it between the two bowls of my cat's food so that Roomba i7+ would easily ignore them. Built-in cameras and sensors drive the smart mapping capabilities that allow the robot to learn the layout of every room on every floor of the house and I have to say it does it really well. To complete the cleaning of my apartment, Roomba i7+ takes about 50 minutes, which may seem like a lot of time at first glance, but... who cares if the robot cleans itself when I'm in the office? Not to mention the fact that I no longer have any intention of picking up the hair left by my cat around the house. So, as far as I'm concerned, it could take up to two hours. Anyone who knows me a little knows how fanatical I am about automation. Yes, the time factor is very valuable to me, so I always try to automate any process that takes more than a few seconds. Domestic chores, let's be clear, nobody likes them, much less housekeeping, which is why I was delighted when the first vacuum cleaner robots started to arrive. However, no matter how efficient today's robots are in cleaning our floors, there is always a problem: regular maintenance. These devices are certainly good at cleaning (more than me for sure), but at some point, it is still necessary to empty its drawer and the frequency with which you will have to do so may depends on several factors. Most vacuum cleaners have a container capacity of between 0.5 and 0.7 liters, which is far too small for a two-room apartment like the apartment I live in, especially if you have a long-haired pet like mine, which forces you to empty the drawer at least once during each cleaning cycle. Most robots are therefore still a long way from being my perfect automated cleaning assistant. iRobot seems to have listened to my words and managed to achieve what I've always dreamed of: Roomba i7+, the robot that cleans the house and cleans itself! The charging base has in fact been enriched by an automatic emptying system. Whenever Roomba i7+ detects that the container is full, it returns to its base and empties it into a bag via an integrated vacuum system that can hold up to 30 times more than the robot's capacity. This means that if you perform a daily cleaning cycle you will only have to replace the bag once a month! What more could you ask for? Say "all", and the robot will clean the whole house. For those who do not have a smart speaker, there is always the excellent official iRobot app, thanks to which you will have complete control over your robot and the cleaning of your home. Inside you can program the cleaning of a room or the entire house thanks to the Intelligent Mapping Imprint system. Probably one of the biggest drawbacks of the Roomba i7+ is the size of the charging station which is not only difficult to hide, but also complicated to decide where to place it. Anyone who has bought it will surely have realized how fussy this vacuum cleaner robot is about the positioning of its base, as it needs at least one meter of space in front of it and another 40cm on each side. These requirements forced me to explore the apartment looking for a suitable place with a power outlet, of course. The Roomba i7+ is a really complete robot in every aspect and its automatic emptying function makes it absolutely not comparable with any of the competitors currently on the market. The only barrier to the purchase of this vacuum cleaner robot is the price - a figure that could surely direct you towards cheaper devices that can better fit your budget. If you want to get the same robot at a lower price, we recommend Roomba i7 (without the Plus), which offers all the same features as the model reviewed, but the package does not include the charging base with the automatic emptying system. Speaking of cheap robots, it is fair to also mention Eufy RoboVac 30C that with a price of around $340 will offer you excellent performance, good battery life, and a well-made app.